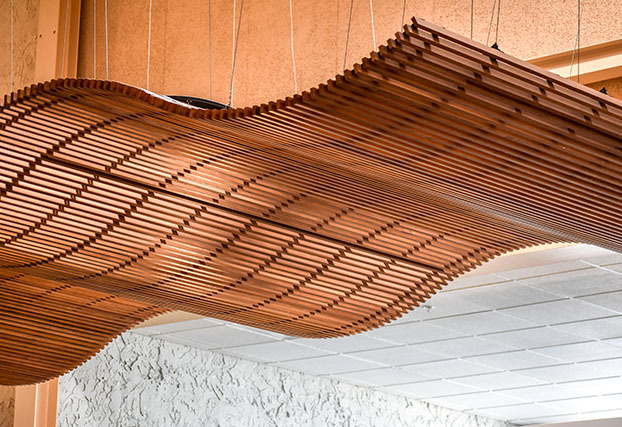 Developed by a group of owners with deep backgrounds in the wood ceiling industry, 9Wood's managerial staff brings more than 100 years of combined experience to the market. In the 13 years since the company's start, we have shipped over 7 million square feet of finished goods to job sites in six countries across three continents. 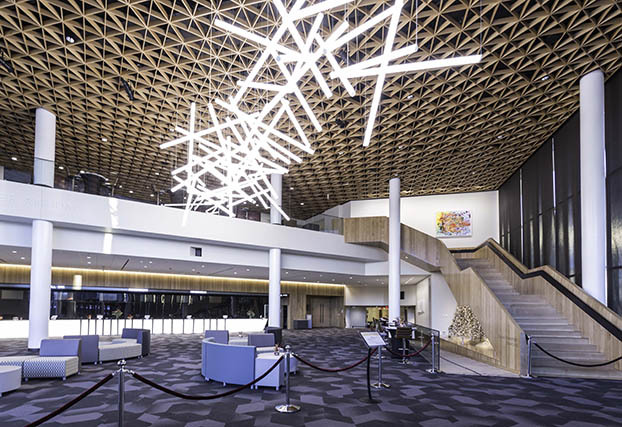 Our projects have been recognized by multiple industry associations, including 26 Construction Excellence awards in ten categories from the Ceilings & Interior Systems Construction Association (CISCA). Connect with an independent Sales Representative in your region. NV Portland. 1100 Cross Piece Grille, Western Hemlock. UT Rio Grande Performing Arts. 2100 Panelized Linear, Western Red Cedar. Helios West, Berkeley. 2300 Continuous Linear, Reclaimed Teak. San Francisco Federal Office Building. 5300 Diamond Perf Tile, White Maple. Los Angeles Harbor College Theater. 4500 XL Channel Tile, FSC White Maple. The Atrium, Victoria, BC. 8100 Wood Grille Wave, Western Hemlock. Sacramento Airport. 3100 Acoustic Plank, White Maple. SFU Shrum Chemistry Building, Burnaby, BC. 1300 Lay-In Grille, White Maple Veneer. Loma Linda University, San Bernadino, CA. 8200 Linear Wave, FSC-Certified Cherry Veneer. 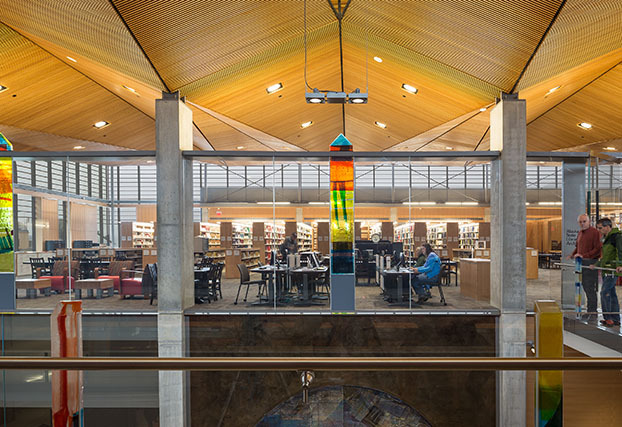 Alaska State Library Archives Museum. 1100 Cross Piece Grille, Western Hemlock. Brookfield Zoo, Chicago. 2300 Continuous Linear, Western Hemlock. 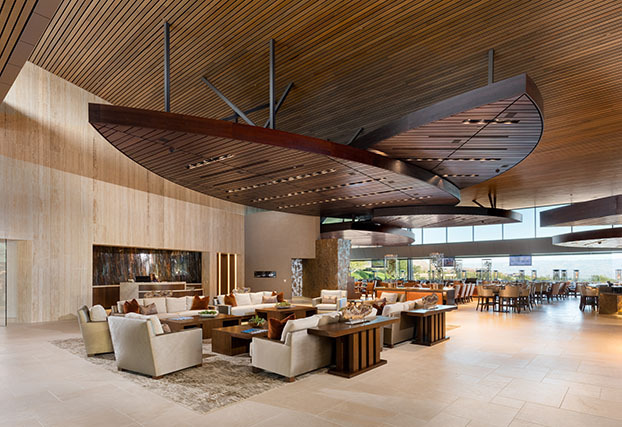 9Wood’s custom wood ceilings offer an expansive palette of options to designers. 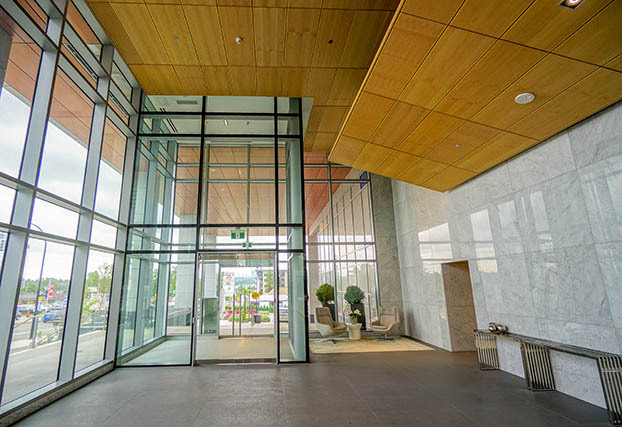 From classic wood grilles and linear ceilings to unique curved tiles, 9Wood is passionate about providing products that meet the design intent. 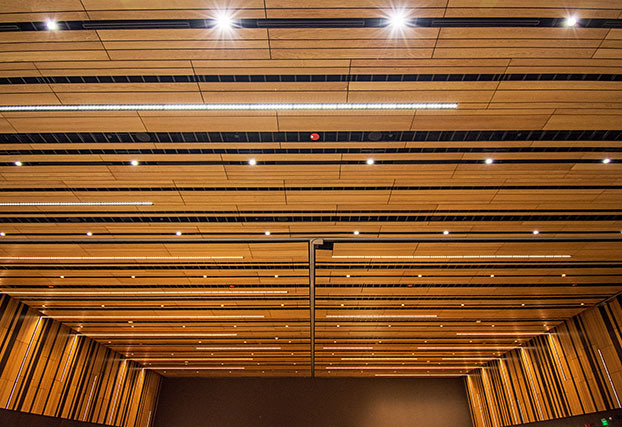 And because 9Wood specializes in doing only custom wood ceilings, our project management and engineering services can ensure your vision is carried through to a successful installation. Do you have a project on a tight schedule? 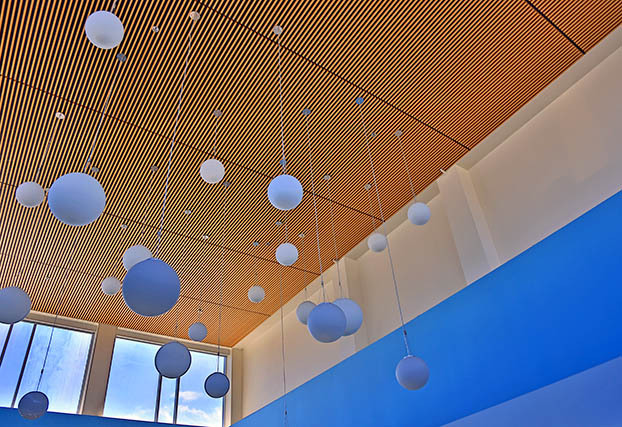 Our Fast>Track program offers custom wood ceilings with over 100 different combinations of styles, species, and stains, all delivered in 3-6 weeks. We even guarantee your ship date! 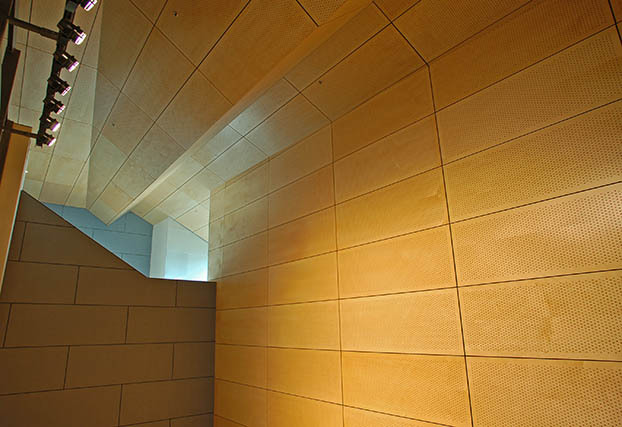 If you’ve got a project requiring a high degree of color consistency, check out our Engineered Veneers. These are 100% real wood veneers, dyed to look like popular domestic species, or hard-to-source exotic species. They are even available FSC-certified. Click the link below to see our collection. 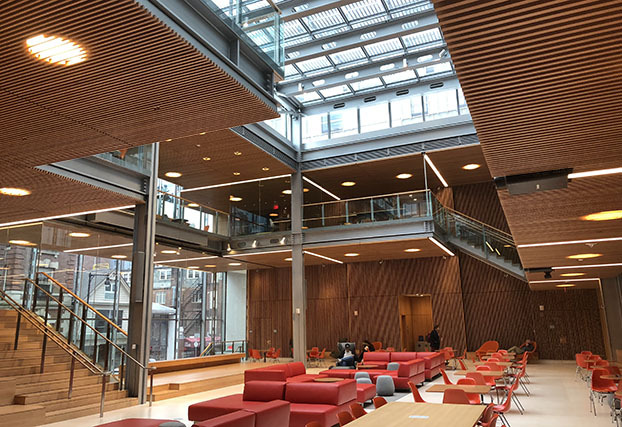 And if you’re looking to learn more about wood ceilings, or want an AIA CE credit, check out our video course, “Suspended Wood Ceilings: Design to Delivery” and receive one Health, Safety, and Welfare Learning Unit (1 HSW LU). 9Wood's mission is "To improve the economic welfare and quality of life of all stakeholders." The environment is a stakeholder and 9Wood is committed to continuous improvement of sustainability practices. 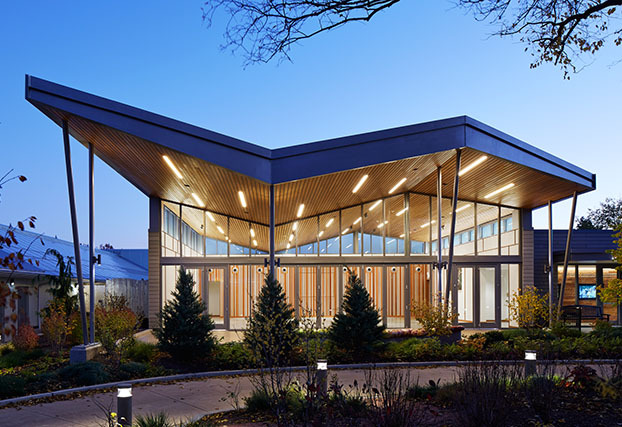 Some of the practical measures 9Wood supports are recycling as much waste as possible, donating wood to local schools and community groups, and incentivizing public transportation use for employees. 9Wood is honored to be the first company in Springfield, OR to receive BRING Recycling’s re:THINK award. This award is given to local businesses demonstrating sustainable practices. 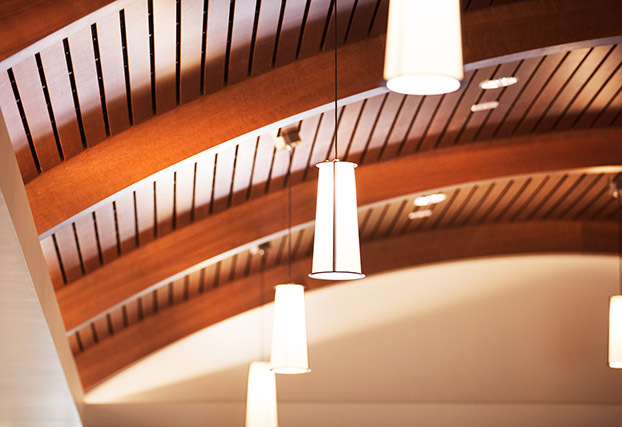 For LEED, LBC, or WELL projects, take a look at our FSC-certified or reclaimed wood options. FSC-certified wood is sustainably harvested, backed by a vetted chain-of-custody process that ensures it is from a certified source. 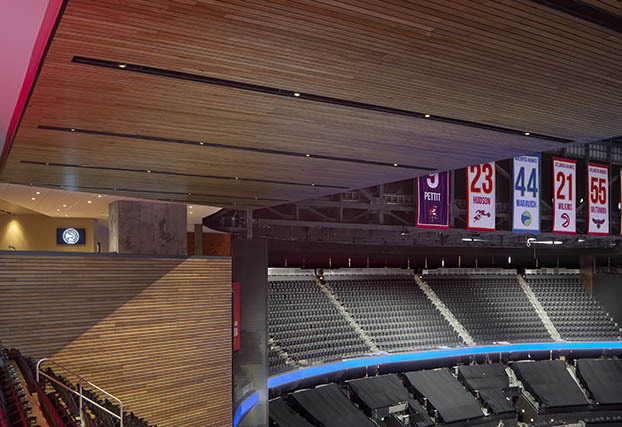 Reclaimed wood options are an excellent way to re-use wood from former structures such as barns, bridges, and bleachers to bring richness and character to your ceiling.